You are here: Home / Breeds / Get To Know the Red Heeler in 7 Questions! The Red Heeler is a medium sized breed of dog hailing from Australia. Famed for their herding abilities, they have long been used by Australian farmers to herd and protect cattle. Nowadays, you’re more likely to see them as family pets. Popular around the world, this highly intelligent breed requires plenty of exercises to keep him mentally and physically stimulated, and thrives in active, outdoorsy families! 1. Why Are They Called Red Heeler? 2. How Did The Breed Begin? 3. When Did They Become Popular in The USA? 4. What Are Red Heelers Used For? 5. What Are Some Red Heeler Fast Facts? 6. I’m Sold! How Do I Get My Own? 7. Is Training an Australian Cattle Dog Different To Other Dogs? The Red Heeler is perhaps better known by his other name, The Australian Cattle Dog. He also goes by Blue Heeler, Queensland Heeler, and Cattle Dog. All of these names refer to the same dog. However, the Red and Blue Heelers are, of course, named for their distinct all over mottled coloring. The American Kennel Club, however, recognizes all variations as an Australian Cattle Dog. Now that you know about the colors, do you know why they’re called Heelers? Well, this name goes back to their roots as cattle herders, where they would be used to encourage lazy cattle to keep moving by gently nipping at their heels. This was never used to injure cattle, or in a way that could be deemed animal cruelty – instead, it’s akin to giving your dog’s leash a little tug to remind him to walk forward. The name Red Heeler doesn’t seem so original now, does it?! The Red Heeler hails from Australia, the state of Queensland to be more precise! And they date back to the early 1800’s, initially bred by a chap named George Hall. George was the owner of two cattle stations in Queensland but wasn’t happy with the droving (herding) dogs available in the local area. He decided to import Border Collies from his parents native country, England, and crossed these with Dingos to develop what we now know as the Red Heeler! The breeding program went on for many years before it was considered “perfected,” and in 1903 the New South Wales Department of Agriculture created the very first breed standards. Well known as the most intelligent breed of dog in the world, the Border Collie comes from the borders of England and Scotland. This breed is widely used as a sheepdog around the world, and also partakes in sporting events such as sheepdog trials, canine agility, and heelwork to music with great success. Most commonly seen in traditional black and white, the Border Collie may also possess a red, blue, or brown coloring alongside their white markings. Their intelligence makes them a playful and friendly dog if well socialized but can be prone to anxiety around strangers if not taken out from a young age. The Dingo is a wild dog native to Australia; evidence suggests that he has never been entirely domesticated, although there are some instances of Dingoes being tamed – hence the Red Heeler coming into existence in the first place! This canine is in fact not a true dog breed and is considered the exact opposite of man’s best friend – a terrible pest. 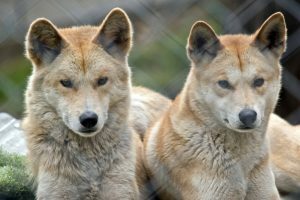 A Dingo’s diet is made up of everything from insects, to cattle, and they often get in lots of trouble in Australia for eating farmer’s animals. For that reason, many farmers employ guardian animals – such as the Maremma Sheepdog, Donkeys and Llamas to scare away dingos who are on the lookout for a meal. Even though the Red Heeler has been around for quite some time, the breed didn’t begin to see a popularity rise in the USA until the 1950’s when Australian vet Alan McNiven having caused quite the controversy in his home nation – exported some dogs to the USA. McNiven had experimented with his breeding program, using not only Border Collies, and Dingos – but adding Kelpie, German Shepherd, and Kangaroo Hound into the mix. He was deceitful in his ways of trying to register his dogs as purebred Australian Cattle Dogs and was therefore expelled from the Royal Agricultural Society Kennel Club in Australia and had all of his dogs stricken from the registry. This didn’t stop McNiven. And after striking up a friendship with Jack Woolsey – a fellow veterinarian based in Santa Rosa, California – Woolsey brought some of McNiven’s “Improved Dogs” into the United States. 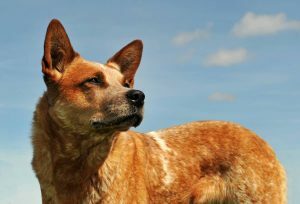 He bred them back to registered Australian Cattle Dogs – and thus developing the Red Heeler that ranked 54th in popularity in the USA as of 2016. To this day, these dogs spend their days in the farmer’s fields herding sheep, and cattle, as well as participating in most dog sports. They seem to do exceptionally well in Disc Dog (Frisbee for pooches!) and Heelwork to Music. The Australian Red Heeler is also at home in the show ring, but many breed purists complain that the show dogs are being bred to produce a dog that is too short in the leg, and stocky in the body to do the fieldwork that he was initially intended. And therefore – not fitting the breed standard. Most Red Heelers are family pets, and do a great job of it! These incredibly friendly, and playful pups make for an excellent addition to an active, outdoorsy family. Did you know that Red and Blue Heelers start out as almost wholly white puppies? Their coloring only comes through as they get a little older. No matter which color strikes your fancy! 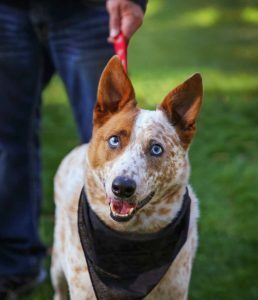 Before you even begin to look into finding your very own Red or Blue Heeler, it’s incredibly important to take into consideration how much exercise these dogs need on a daily basis and whether that will fit into your current lifestyle. A Labrador may require only 45mins of exercise per day, but with a Red Heeler, you’re looking closer to two hours of activity every day. Of course, some dogs are lazier than others, but it’s always best to pick a dog breed that will fit your energy levels – and not just find the cutest one and expect him to cope with your life! Now that you know that your activity levels line up with Mr. Heeler’s – It’s time to start looking for a reputable breeder! So, what do you need to check to make sure that this is the breeder to buy from? If you happen to have a friend who just welcomed home their very own Red Heeler puppy, ask where they got it, and if they would recommend the breeder. And hey, even if you don’t know anyone, a quick visit to the local dog park can give you some promising leads! Once you have a few phone numbers of breeders, chat with each one and ask questions about whether their dogs have passed health checks, or if they have stayed in touch with owners of previous litters. You can usually tell a lot about someone just from speaking to them, and if one breeder stands out heads and tails above the rest in terms of enthusiasm, and is asking you questions too – you’ve probably just found your winner! Now that you’ve found your breeder, or shortlisted a couple of possibilities – it’s critical to do a home check to make sure that their dogs appear happy and healthy. When arriving at the breeder, by all means – go straight in for coffee and chat, but you absolutely must ask for a tour of their entire facility. Many puppy mills operate by pretending to be wholesome family breeders, and no reputable breeder will be offended by you asking to double check. Quite the opposite, they’ll be pleased that a responsible dog owner has walked through their door, and it will mean that they trust you with their precious bundles of fluff all the more! The internet is wondrous, I mean – hello, you’re reading this article on the internet right now! A quick Google of a breeder’s name or their stud dog’s registered name will likely yield plenty of results that will give you an idea of their reputation. Look for reviews from previous owners; you want to mainly look out for forum posts of owners who ended up with Red Heeler pups that ended up having medical issues as they turned into adult dogs. You’ll likely need to ask permission from the breeder to allow their veterinarian to give our medical information, but this could be a great way to find out whether past litters had suffered from any medical issues. And, of course, whether the vet often sees the parents, and what level of health they’re usually in. Because these dogs are incredibly bright, yes there are additional considerations when training a Red Heeler. Mainly, they need structure and continually evolving mental stimulation to keep them from using their increased brain power for mischief! For that reason, many owners start their Heeler puppies obedience training from eight or nine weeks at home and then progress to taking them to puppy training classes for an additional challenge and to socialize. 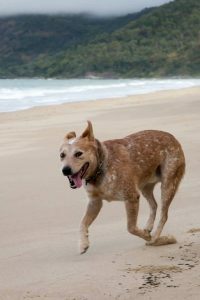 Rescued Red Heelers often join their families at an older age, but that doesn’t mean that poor behavior is ingrained – for life. Thanks to their sharp minds, the Heeler is not only easy to train but easy to re-train too! This Cattle Dog does have a strong instinct to herd, and he has been known to try to herd the kiddos in his family if he doesn’t have anything else to keep him occupied. It sounds cute, but to save from any accidental tumbles of tots, it’s a good idea to convince Fido that there’s more to life than herding! Another common problem with the Red Heeler is their sheer overconfidence. These medium-sized canines just don’t realize how big they are and while this can have marvelous outcomes, like giving them the confidence to jump on a surfboard and surf the waves with their owner. It can also mean that your furry member of the family can attempt to herd cars or horses – both of which, we know, are big enough to do him some severe damage. But don’t worry, these little traits can be annoying, but with the correct training approach from the get-go – your Heeler can turn out to be your greatest dog of all time. 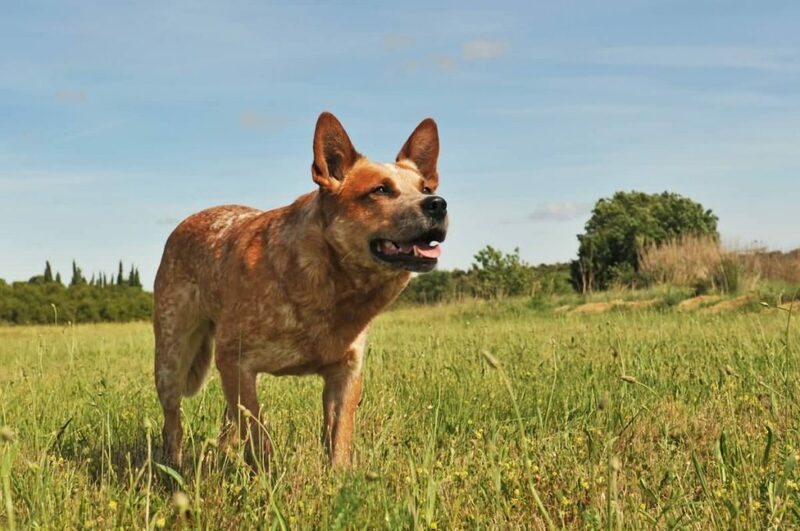 The Red Heeler is a phenomenal breed choice for the most active people. 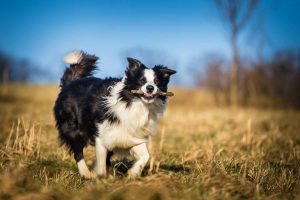 With energy aplenty, tenacity to spare, and an infectious enthusiasm towards everything – this dog breed is a joy to be around. He wouldn’t suit a Netflix and chill lifestyle and is prone to behavioral problems if not kept adequately stimulated. As much as I love the Heeler, he wouldn’t fit my current lifestyle. Maybe in a few years! How about you? Share your thoughts in the comments! Red Heelers and Blue Heelers are the same breed, the Australian Cattle Dog. Red Heeler parents can have blue puppies, and Blue Heeler parents can have red puppies. Most litters have more than one color of coat, including blue, red, mixed red/blue, and occasionally black puppies. The puppy’s face and ears, known as it’s mask, will have color at or soon after birth, with the rest of the body turning color later. Heelers can be stubborn or independent thinkers, but they usually have a very close relationship with one member of the family who offers the dog structure, affection, and activity. They will go to great lengths for that human. They also will supervise children attentively and comfort crying children. While they require little grooming, you will need to sweep and vacuum the entire house multiple times per week. Each time I sweep, I get enough fur to make a new puppy.. When they “blow their coat” twice a year, you can stroke the dog once and find a clump of fur in your hand! This is not a hypoallergenic breed. Help. My red Heeler nips at every one who wants to pet him. Any suggestions? i had a dog and his breed was/ Red hound, australian heeler. We rescued a red heeler 5 months ago. He has never like my husband. He tolerates him but sometimes he will growl or bark at him. He’s timid around most adults. You have to ignore him and he will eventually come around. But he loves kids. Any suggestions on changing his attitude toward my husband?